The Bank of Israel (Hebrew: בנק ישראל‎‎, Arabic: بنك إسرائيل‎‎) is the central bank of Israel. It is located in Kiryat HaMemshala in Jerusalem, with a branch office in Tel Aviv. The current governor is Karnit Flug, the first female Governor of the Bank of Israel. When Israel was granted independence in 1948, the power of note issuance was vested with the Anglo-Palestine Bank, which was refounded as Bank Leumi in 1950. Monetary policy and banking supervision remained controlled by the Ministry of Finance. 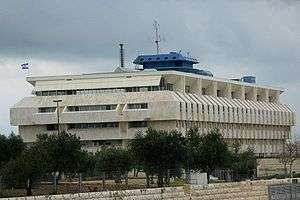 The Bank of Israel was founded on August 24, 1954, when the Knesset passed the Bank of Israel Act, which ceded the currency issuing and regulatory functions of the Ministry of Finance to the newly formed Bank. Control over foreign currency exchange was not given to the bank until 1978. The Bank was made completely independent in 1985 and since 1992, the Bank manages its monetary policy so as to meet the inflation target set by the Israeli government - which is today a range of between 1 and 3 percent per annum, considered as price stability. Additionally, the Bank manages the Foreign Exchange Reserves. In 2010, the Bank of Israel was ranked first among central banks for its efficient functioning, according to IMD's World Competitiveness Yearbook. In March 2010, the Knesset approved a new Bank of Israel Law which took effect on June 1, 2010. The new law defines the goals of the bank and gives the bank independence in determining its policy tools and the way of implementing them. The law changes the framework in which major decisions are made in the Bank of Israel. Decisions regarding the rate of interest and monetary policy in general will be made by a Monetary Committee, while the managerial decisions will be approved by an Administrative Council. This brings the Bank of Israel more in line with the decision making procedures of other financial institutions. Daniel Maman and Zeev Rosenhek. 2011. The Israeli Central Bank: Political Economy, Global Logics and Local Actors, Routledge. 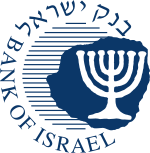 Wikimedia Commons has media related to Bank of Israel.